One of the interesting new application categories for Internet of Things (IoT) technology is the augmentation of existing consumer electronic devices. While most of the market coverage to date has been focused on wrist-based wearables, one of the less prominent areas has been the development of ear-based wearables -- also know as hearables. 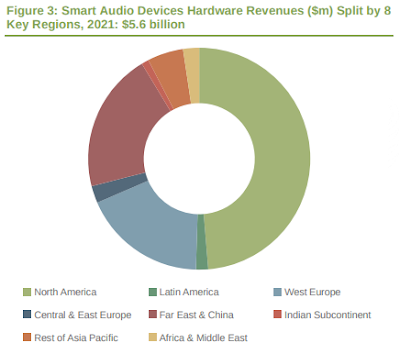 A new worldwide market study by Juniper Research has found that revenue from the overall category of 'smart audio' hardware will more than triple over the next four years, rising from an estimated $1.4 billion this year to over $5.5 billion by 2020. While Juniper expects part of this to be driven by ear-based wearables like the Bragi Dash and HERE Active Listening, the category will be most successful in the smart home space, with Amazon Echo, Google Home and other unit-based smart audio devices vying for popularity as the next platform for smart devices. The resulting research report found that the likely reason for the dominance of home-based smart audio devices is two-fold: people are not yet willing to talk to their cognitive devices in public, and also that smartphones can provide similar functions through simple earphones with a microphone. Juniper analysts believe that these factors combine to limit the market for people who want a digital assistant device with them while on-the-go. Home-based smart audio devices, however, operate in a private environment, overcoming the social reluctance, and do not have to challenge the smartphone to the same degree. According to the Juniper assessment, for this reason they expect more success from unit-based smart audio devices than hearables. There will however be a smaller market for hearables that offer various audio features, like active noise cancellation and call handling as well as providing audio, but the biggest market for these will be fitness devices. These can provide accurate biometrics as well as voice feedback from a piece of coaching software, but only a certain kind of consumer will buy that sort of device. "Smart speakers win out because while they also need a context, their form factor gives them an almost universal one, while hearables fill specific audio niches," said James Moar, analyst at Juniper Research. "As a result, smart speakers and hearables will fill very different roles, despite relying on similar software capabilities in many cases."